Invoke Archangel Gabriel for help with Clarity, Purity, Order & Discipline. He works to create more Harmony, Beauty & Purity on Earth. He will help you to develop your intuition & to find your true path. Call upon his help if you feel in need of purification. Archangel Gabriel is also the Angel of Childbirth, so invoke his blessings for all newborn souls. The bracelet comes in a white box with a leaflet in five languages. 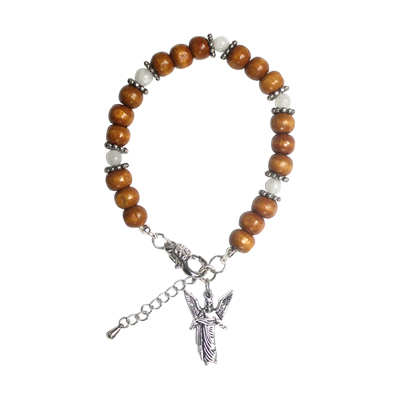 Material: wooden beads, semi-precious rainbow moonstone, zinc metal.